I don't mind any of the two options. At zero aoa, what will the balance of the car be at high speeds (+90 mph) with all velox front aero? I think having a mid size wing that is legal for most classes is the best option. 0 AOA relative to the ground, or airflow over the rear of a twin? Remember, 0 AOA relative to the ground is still some effective AOA due to the airflow over the rear of the car, for a portion of the wing. This is also why a chassis-specific 3d wing can be superior to a 2d airfoil, provided it is mounted in the proper position. The higher you go, the less the twist matters. Well it depends on their design as you said 2d is different than 3d. For both cases I mean the lowest aoa possible at which it is producing the lowest downforce numbers. As most gt wings (+1600mm) are producing more than enough downforce at 0 aoa. It would be nice to have a mid size low drag wing that start producing downforce at 0 aoa where it can be balanced out easily with front aero. Also if its legal for most classes that would be a win win for us. Here is Element Tuning's setup. Is this something like what you had in mind? Initially, yes. However, I'm really enjoying sitting back and listening/hearing some of the ideas being thrown out there. Some of them aren't necessarily plausible or make a lot of sense, others are really helping Paul and I potentially come up with something neat for you guys. This is all part of brainstorming honestly, and it's neat to have it be a positive thought process with the community to hear/see what you guys are after. So far, glad we started the thread as it's lead to some neat potential new ideas for mounting and future product development . 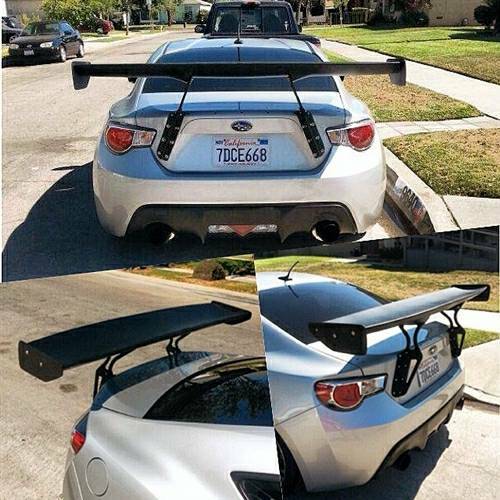 I was curious on this whole "chassis mounted" wing thing so I started doing some research. I found a thread on Track Junkies and posted it below. There is some pretty good data in there along with some valid arguments all before the thread goes sideways and the topic blurs....like most threads. lol. Anyway. They all seem to think the chassis mount is "a gimmick" for "street" cars and I tend to agree. Just my 2 cents. I am but a mere design engineer that is over excited for a wing with data to be produced. 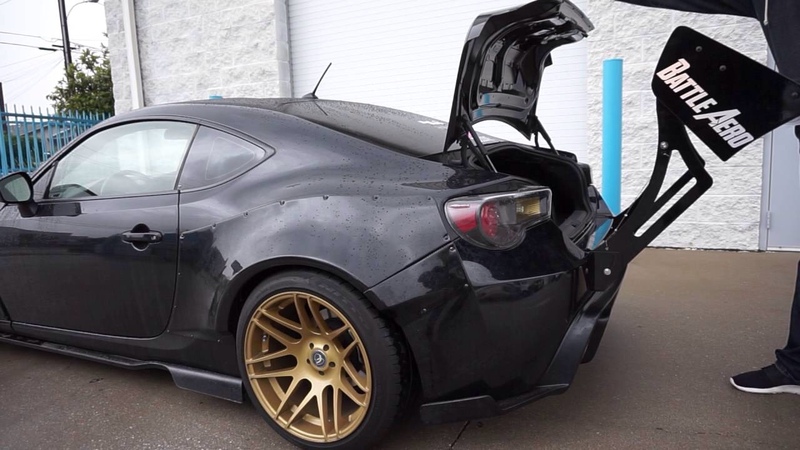 Speed Academy has the Voltex Swan Neck Wing. There is a company called BattleAero that has a chassis mounted swan neck wing that still allows use of the trunk. They fold the wing down and away from the trunk, obviously not the easiest way to use a trunk but it's an idea. I like how their wing looks and they have options for endplates as well, but there is zero research into performance and they provide literally nothing to state it aids in any kind of performance. But just an idea. Looking forward to see what happens with this. Just going to point out top tier racing classes are not using swan neck. So either they are doing it wrong, I don't know of some class rule against swan necks, or swan neck isn't even worth it. So I am going to say A. Seems like a terrible area to mount a wing. Bracing that area of the trunk wont be as effective as mounting the wing on top and bracing the top portion of the trunk. Velox. what do you think about this idea? It seems like you could design a swan neck from this type of mount. I still stand by my original post in which I stated that a "typical" trunk mount solution would be preferred. But this could be a plausible solution to create a swan neck design.